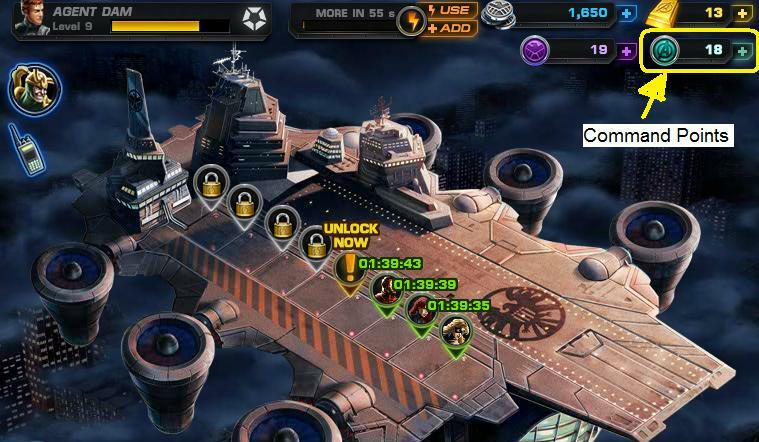 Marvel Avengers Alliance is a popular online tactical fighting game in Facebook, commonly known as Avengers Alliance or MAA as its short form. One of the tactical and interesting part is to recruiting heroes in your team. A powerful team of heroes will lead you to gain experience and other important stuffs needed on your way of destroying evils.You will get some of them free (like Iron Man, Black Widow, Hawkeye). But for most of them you have to spend Command Point to hire/recruit. Therefore you can interpret it as a hero buying element. The command point number is marked as light green A symbol on the top right hand side of your game screen (as shown in figure below). While you hit your opponent/s, there will be a chance that the opponent/s will drop command points. Like other fighting games you will encounter BOSS. If you can defeat BOSS, you may get 1 or 3 or 5 command points. You may get command points by defeating your opponent/s. If you master a mission with 5 stars, you will earn 5 command points. 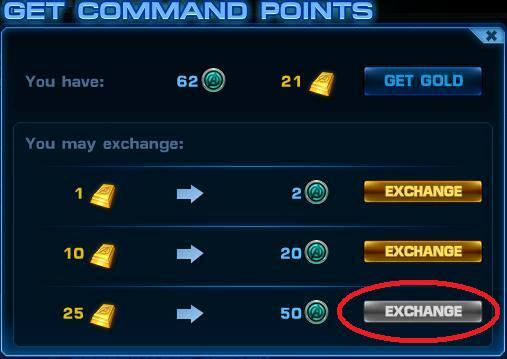 command point, "Exchange" button will be greyed out. Above I discussed/presented probably some of the ways to acquire the command points in Marvel Avengers Alliance. I will be glad to learn if you know any other tips to get it. Please feel free to share your experiences here. If you like these tips here or my another post on how to get currency and points please press the "LIKE" button below to support the post. Thanks for the tips. But your post just confirms what I see as the main flaw of this game. A flaw so bad that makes the game not enjoyable, IMHO. Meaning, you HAVE to spend money to play the game. The amount of command points you gain from playing the game is just nor enough to unlock new heroes. It will take a regular player something like 2-months to accumulate 50 commando points necessary to unlock Daredevil, the first (not free) required hero. Really frustrating. The game seems more like a trap to make you spend money. I've only been playing for about two weeks, and haven't spent a dime of actual money. I've accumulated (and spent) over 200 command points just by playing once or twice a day. The boss' drops are infrequent, but if you critical hit the enemies you can pick them up semi-regularly. Guys you can just farm command points from epic bosses,Such a boss exists in chapter 2 mission 3,'Elektra' is the boss' name,Gotta finish the mission 100% including all deploys all enemies and all minibosses and bosses,then the "epic boss" appears. P.S. you MUST lose the fight,that'll let you repeat the boss without repeating the whole mission,But if you disconnect/crash or something,The command point doesn't count,So it's basicly like a 8 or 9 times out of 10 type thing. The technique is proven by many people including me. i've started farming cp's from elektra at lvl 14,got capt america + avengers costume now at 25 + black cat + avengers for ironman in a bit hopefully. Hi Nur, thanks alot for indetail procedure. I'm sure i'm gonna try this soon as soon as iwill be again in the game. what do you think are the best combination of heroes for fighting? It’s not easy, that’s for sure. We are a small dedicated team that is very passionate about Marvel and “Avengers Alliance.” After three and a half years of releasing content on almost a weekly basis, the team has grown Marvel Avengers Alliance to become something of a well-oiled machine. From stunning art and challenging combat to a compelling story written by Alex Irvine, we do our best to breathe new life into MAA with each new content release.